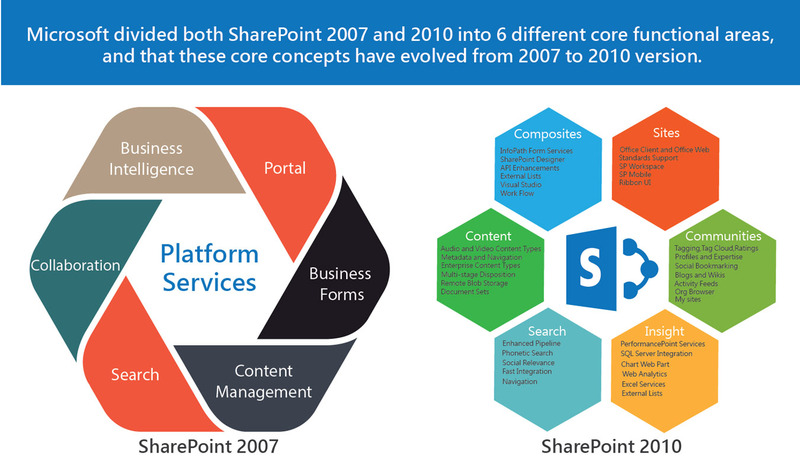 Microsoft SharePoint 2010 is a Business Collaboration platform for the enterprise and the web. It crosses organizational boundaries and supports a number of activities, from workplace collaboration, to document management, to web content management and much more. SharePoint 2010 has gone to an extent to provide improved user experience, some of it is related to improved collaboration and business processes. If you compare the above two diagrams, what you see is that it becomes less about the technology capabilities (i.e. content management, collaboration, search, business intelligence) and more about how these technologies support the user or the business: communities, content, insights. Essentially, everything you do in SharePoint is site-based. These sites can be accessible through your intranet, extranet or internet. They can be collaboration workspaces, business dashboards, portals, your public web presence. You also have personalization via MySites, content targeting and tagging. Perhaps the point here is that whether you are building an intranet, an extranet or an Internet site, the tools you need are similar. Personalization, collaboration, communities, social networking, content management -these things can be leveraged across any type of site you create. Another important point to make here is that SharePoint 2010 is a platform that can support the growing number of mobile workers across an organization. This new virtual cube experience is supported through collaboration, content management and community capabilities. And SharePoint Workspace has arrived to support offline access (sometimes we do disconnect from the network).